A leading manufacturer of packaging solutions wanted to improve the transport efficiency of finished product between manufacturing and the warehouse. 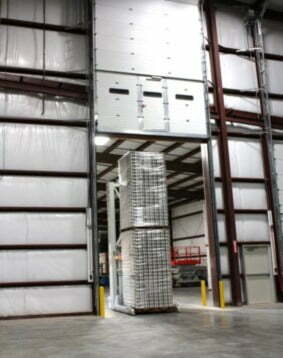 In addition, they wanted to increase the storage density of their warehouse without modifying the facility. To improve transport efficiency and increase storage density, Amerden designed an AGV that automatically stacks and transports two 8.8 feet tall loads of finished product packed on slip-sheets. In the warehouse, the Amerden AGVS accurately navigate the stacked loads into deep lane storage locations consisting of 160 lanes and 2300 floor locations. The AGVS stack loads up to 4 high. The warehouse consists of a large open space with most of the columns hidden behind stacks of tall loads. For laser navigation to operate, the laser scanner must be able to see above the loads; for this project the scanner had to be mounted 20 feet above the floor. However the manufacturing area had overhead equipment that limited the height of the scanner to 12 feet. Amerden designed an innovative and economical solution. The laser scanner is mounted on an automatic 20 foot extendable mast. 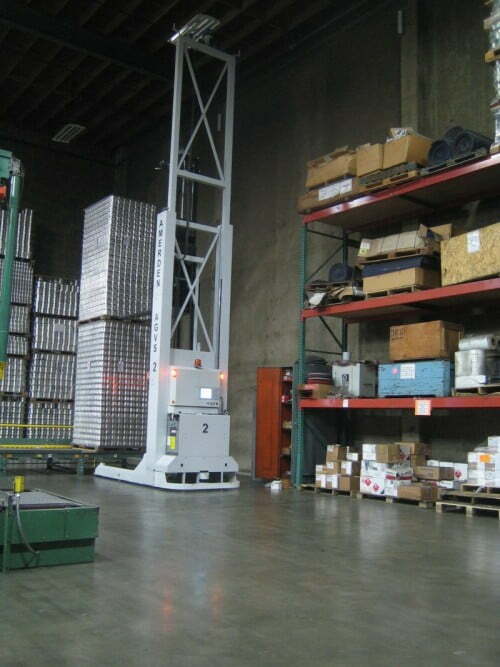 This enables the vehicle to accurately navigate the deep lane storage aisles of the warehouse and the manufacturing area. The Amerden System Manager provides efficient control and monitoring of the AGV System. The System Manager receives transport orders from the customer’s host computer system. The System Manager then optimizes the orders and manages the AGV fleet to insure efficient material transport throughout the facility. The System Manager also provides real-time tracking and status of the AGVS plus a complete set of operating reports to help management tune the processes to achieve maximum overall performance. Intelligent automatic battery charging stations provide equalization charge schedules to maximize battery life and minimize system downtime. 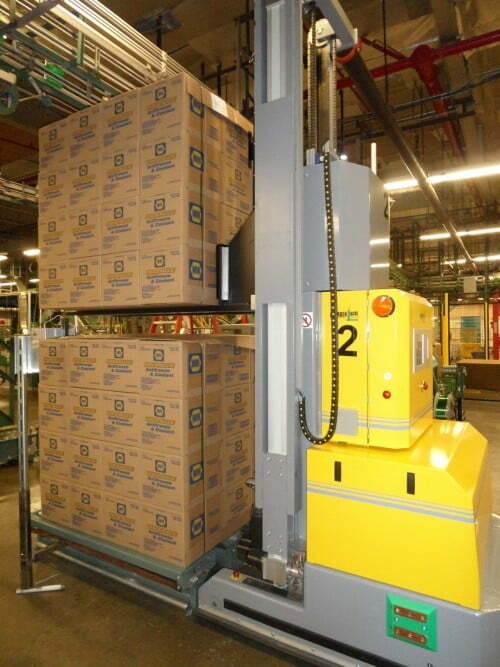 This 24 x 7 operation is another example of productivity through AGV Technology. 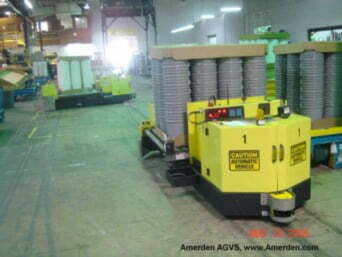 When a West Coast manufacturer wanted to automate their finished goods transport, they looked to Amerden AGVS for help. The Operations Management had a long list of project requirements including creation of a safe work environment, reducing labor cost, minimizing fork truck traffic, reducing product damage and tracking finished goods from manufacturing to storage and shipping. Not only was this a tall order,but the loads were very tall as well up to 8.7 feet high with over 20 variations of load heights. The new system would have to create deep lane, stacked storage and track the inventory for over 4,000 pallet locations in the Warehouse and Shipping Area. Amerden evaluated the operation and determined that transporting two stacks of product per trip would yield the greatest return on investment. However, the material is relatively light weight and the 17.4 foot height of a double stack load would cause stability problems. In addition the laser guidance system would have to be designed to see over the height of the stacked loads. Design innovations were needed to solve these problems and Amerden was the only company that had a viable solution. Amerden designed a load handling system that included a specially designed clamping device which can acquire and stack two individual loads. During transport, this clamping device is used to stabilize the load. The second challenge was to find a way to utilize laser guidance for the new AGVS. The laser scanner must be able to see the navigation reflectors. Because the load height in the warehouse can exceed 26 feet, Amerden designed a removable mast for the laser navigation scanner on the vehicles. This mast automatically extends to 26 feet for normal travel and stacking but lowers to allow the vehicles to negotiate areas like doorways and overhead obstacles with an overhead clearance of just 14 feet. Amerden installed its DeCarte AGV System Manager. The DeCarte System Manager receives transport orders from the customer’s host computer system. The System Manager optimizes the orders and manages the AGV fleet to insure efficient material transport throughout the facility. The System Manager communicates with the customer’s programmable logic controllers (PLCS) to control I/O at the stretch wrapper and conveyors. The System Manager also provides real-time tracking and status of the AGVS plus a complete set of operating reports to help management fine tune the processes to achieve maximum overall performance. Productivity through AGV Technology. 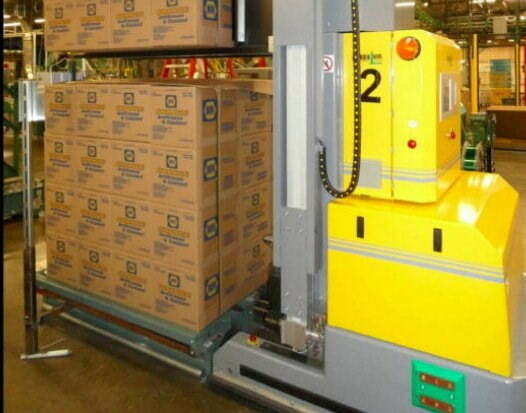 In 2002 a manufacturer of plastic containers installed an Automatic Guided Vehicle System (AGVS) but their AGV supplier soon went out of business leaving the system and the operation in disarray. The company contracted Amerden to return the system to a productive part of their manufacturing operation. 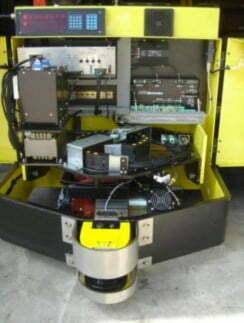 First, Amerden retrofitted the two roller-deck AGVS with new on-board controls to replace the obsolete controls. The new controls provided increased functionality, greater reliability and troubleshooting capabilities. Next, Amerden redesigned the AGV travel paths to create more efficient material flow and more reliable access to each of the 13 pickup locations and 3 drop off locations. Each drop/pick location was updated with modern I/O controls that provide a seamless control interface between the conveyors and vehicles. Finally, Amerden implemented the DeCarte AGV System Manager. This application provides centralized control of the AGV fleet including transport management, traffic management, real-time monitoring, operations reports, AGV communications, and system I/O status. Once the updates were completed, the AGV System achieved greater transport productivity than the original system right after it was installed. An AGV System is too valuable to let fall by the wayside because of age or obsolescence. In addition to new AGV systems, Amerden provides vehicle upgrades, parts or complete system retrofits. Amerden makes the most of a valuable asset and provides our North American clients with productivity through AGV Technology. This AGV System provides just-in-time (JIT) supply of parts for the assembly line of a large automobile manufacturer. The system consists of 28 wire guide vehicles running along two independent travel paths, 24 hours/day, 7 days/week. In the warehouse, automotive parts are loaded onto carts. These parts are designated for a specific vehicle on the assembly line. AGVs transport the carts from the warehouse to the assembly line. Accurate and reliable delivery of the carts is critical to keep the assembly line running and insure optimum manufacturing efficiencies. Carts are automatically loaded and unloaded from the AGVs. To support 24/7 continuous operations, the AGVs are designed for automatic opportunity battery charging. Redundant computer backup with automatic fail-over. Centralized control and monitoring of AGV fleet. Real-time graphical monitoring of vehicle location, status and task activity. OPC Interface to site manufacturing execution computer system (MES) for transport orders and AGV System status. Ability to manually control and/or verify AGV functions. Automatic control of external automation equipment: conveyors, doors, warning systems, etc. Automated AGV system diagnostics and predictive maintenance application software. 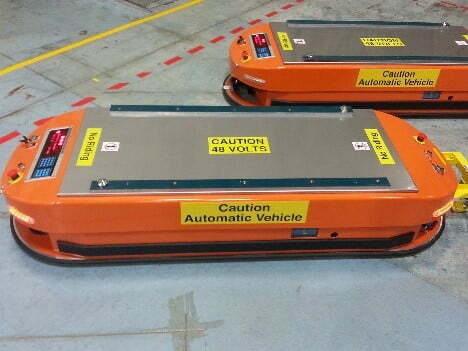 The AGVs include laser based obstacle avoidance technology that provide the highest degree of safety in the workplace, and are fully compliant with the ANSI/ITSDF B56.5-2012, Safety Standard for Driverless, Automatic Guided Industrial Vehicles and Automated Functions of Manned Industrial Vehicles. Safety stops without actually contacting object. Allow smooth deceleration when an object is detected. Variable safety fields for different speeds and avoidance of stationary objects. Ability to automatically restart the vehicle after the object has been removed. Travel path should be easily configurable. Amerden selected laser navigation for the vehicles. Laser navigation provides the level of positioning accuracy required, plus AGV travel paths can be easily reconfigure using software tools. The system includes 4 tugger-type AGVs capable of transporting 4000 lb. loads (5500 lbs. including cart) up 10% ramps. Carts are automatically attached and detached from the AGVs. The system operates 24 hours/day, 7 days a week. To support continuous operations, the AGVs are designed with automatic battery charging. OPC Interface to site manufacturing PLCs for transport orders and AGV System status. Automatically determines optimum delivery locations based on current process conditions. The AGVs include laser based obstacle avoidance technology that provide 360 degrees of protection around the vehicle. The System is fully compliant with the ANSI/ITSDF B56.5-2012, Safety Standard for Driverless, Automatic Guided Industrial Vehicles and Automated Functions of Manned Industrial Vehicles. Not only was this a tall order but the loads were very tall as well up to 8.7 feet high with over 20 variations of load heights. The new system would have to create deep lane, stacked storage and track the inventory for over 4,000 pallet locations in the Warehouse and Shipping Area. The second challenge was to find a way to utilize laser guidance for the new AGVS. The laser scanner must be able to see the navigation reflectors. Because the load height in the warehouse can exceed 26 feet, Amerden designed a movable mast for the laser navigation scanner on the vehicles. This mast automatically extends to 26 feet for normal travel and stacking but lowers to allow the vehicles to negotiate areas like doorways and overhead obstacles with an overhead clearance of just 14 feet. Automatic control of external automation equipment conveyors, doors, warning systems, etc.